* The Kidbrooke Kite spots more completely mental descriptions of Kidbrooke Village, “Black Heath” (wherever that is)… See for yourself here (warning, it’s a horrible PDF). The Blackheath Society supports this event in principle and will play an active role in ensuring that there is a full and proper event management and acoustic plan in place. In addition the Society will lobby for the full reinstatement of the Heath and act to ensure that the Heath is protected, as far as possible, from this intense period of usage. In consultation with LBL, the Society has already recommended that more information be made available to those living within the immediate vicinity of the event. See The Olympic Washerwoman’s Bottom if you missed this the first time around. 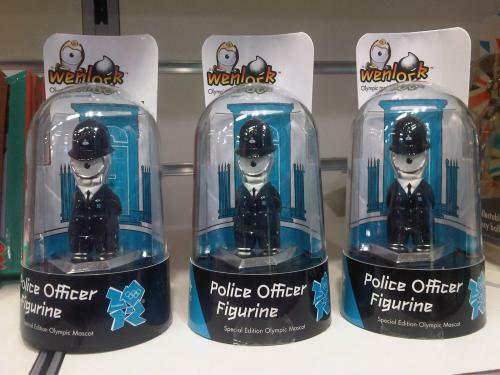 * Kettling 2.0: The Olympic State of Exception and TSG Action Figures – Fantastic article about what the Olympics means for London. Did you know that during the Olympics, there’s a plan to allow the police to search your home without a warrant? Nice. And a great photo at the top of the post. * Finally, hopelessly-unaffordable-but-still-rather-nice: photos of an unrestored 1960s Eric Lyons-designed Span House. A snip at £500k. Lovely wood finishings.